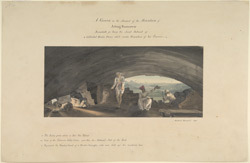 Pen-and-ink and water-colour drawing of a cavern on the summit of Mt. Jetting, Rameswaram by Colin MacKenzie (1754-1821) dated December 1800. Inscribed on the front in ink is: 'A Cavern on the Summit of the Mountain of Jetting - Rameswar. Remarkable for being the Secret Retreat of a Celebrated Hindoo Prince while under Persecution of his Enemies. Sketched December 1800'. Ramesvaram, situated in Tamil Nadu, is a well-known pilgrim centre believed to be where Rama worshipped Siva and connected with the epic Ramayana.